The Polo, the Golf Shirt, the Tennis Shirt. All names can be interchangeable used to describe the classic collared shirt designed back in the 19th century. It was created out of functionality, but remains today a symbol of class, position, and sportsmanship. Apparel described with the three names as above, serves as a fitting match as the piece of choice for any school’s tennis team uniform, or for the employees at your business for the annual golf outing fundraiser. 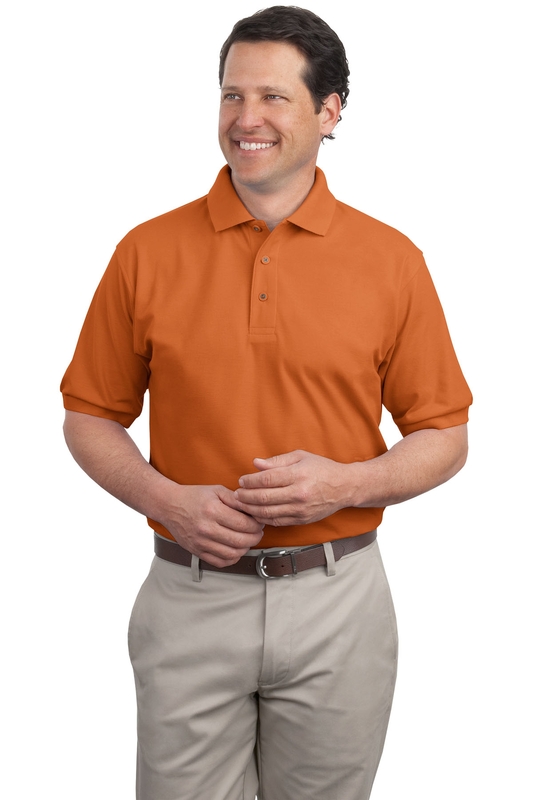 The Port Authority Silk Polo is a classic choice for any promotional need; whether that is for a school uniform, a trade show, or a business gift. If you are looking for your next school or sport’s team uniform or employee apparel The Port Authority Polo would make a smart and stylish choice. Since this product can only be ordered in bulk, the use of this style would make an excellent choice for a uniform or a giveaway prize at a trade show or as a business advertising gift. With the handsome style and fit, combined with the comfortable material, everyone will want one! The Port Authority Polo has the option to be embroidered or screen printed with either a business or school logo. Your business will have its advertising working for itself! Port Authority is a comfortable, stylish T-shirt style Polo that comes in the form of many colors, including: Royal Blue, Coffee Bean, Banana, Bark, Black, Bright Lavender, Burgundy, Clover Green, Cool Grey, Court Green, Dark Green, Deep Berry, Eggplant, Gold, Hibiscus, Kelly Green, Light Blue, Light Pink, Light Stone, Lime, Maroon, Maul Blue, Mediterranean Blue, Mint Green, Navy, Orange, Purple, Red, Steel Grey, Stone, Strong Blue, Teal Green, Texas Orange, Tropical Pink, Ultramarine Blue, and White. The Polo weighs 5 ounces, and is made with a 65/35 polyester and cotton blend. The style includes a flat knife collar and cuffs, and two metal buttons with plastic edges that are dyed to match the thread color. Other features of this style, include double-needed armhole seams and hem, as well as side vents, making the Port Authority Polo a breathable pullover made for both indoor and outdoor wear. Adult sizes come in Extra Small to 6 Extra Large, accommodating any size and body type. Silky soft to the touch, and exceptionally wrinkle and shrink resistant, the Port Authority Polo is extremely comfortable to wear all day while promoting/displaying your business or school’s name, without sacrificing style and professionalism. The Port Authority Polo will make the perfect addition to any establishment that speaks to classic and professional style, commanding a certain authority, as in the name.